A national conference to establish a federal state in Syria has to be held soon, as the crisis in the country is entering a new phase, the Consecutive Board of the Movement for a Democratic Society said in a statement obtained by Sputnik on Saturday. MOSCOW (Sputnik) — The statement went further that federalism was considered the best democratic model for the Syrians, as it represented variety within unity. "Achieving national unity and holding a national conference are a priority at this phase because we are passing through a critical stage that needs dialogue," the statement said. According to the statement, a new stage in the settlement of the Syrian crisis was marked by the Kurdish forces' victories in 2016, which include liberation of terrorists' most important hubs and the launch of the Raqqa campaign to cut links of the Islamic State, outlawed in Russia and many other countries, with the outside world. The Movement for a Democratic Society is a coalition of Kurdish political forces, which has been governing an autonomy in the north of Syria since late 2015. The United States have been providing a significant support for the coalition that was sharply criticized by the Turkish authorities. 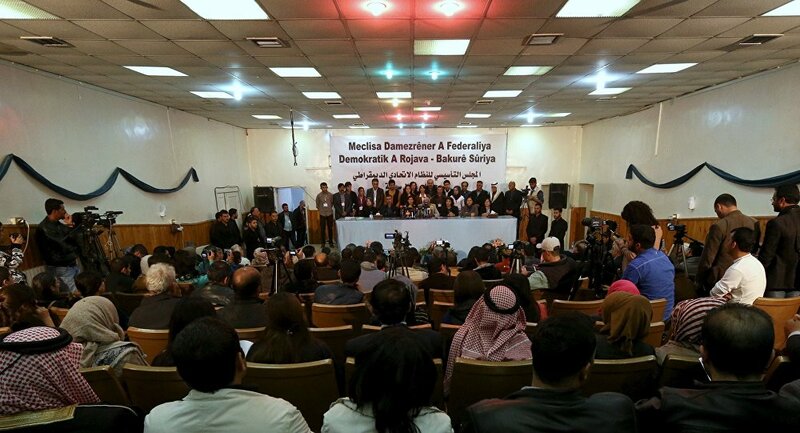 On March 17, 2016, the Syrian Kurds announced the creation of the federal region of Rojava in northern Syria at a conference in the Hasakah province. The initiative was criticized by the Syrian government.